Spinal stenosis, a narrowing of the spinal canal, is a common and potentially debilitating condition. The causes of spinal stenosis can be traced to several elements of the spinal column anatomy, including the lamina, the ligaments, the discs between the vertebrae, the facet joints that connect the vertebrae to each other, nerve roots, and the spinal cord. The narrowing of the spinal canal may result from abnormal bone growth, tissue growth, the buckling of the ligament in the canal or the combination of any or all three in tandem. While each case of spinal stenosis occurs for different reasons, it is generally accepted that spinal stenosis is a long-term degenerative disease. Over time, the space between the nerves and vertebrae decreases, putting pressure on the spinal nerve roots or the spinal cord. In the less common hereditary form of spinal stenosis, the diameter of the spinal canal is unnaturally small from birth. 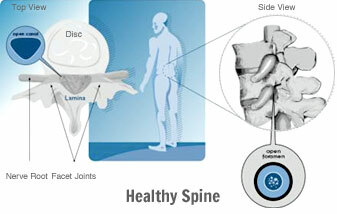 The condition occurs most often in the lower back, or lumbar region of the spine, termed lumbar spinal stenosis. The disease can be present in young patients and it can also manifest itself in patients who are octogenarians. Depending on the severity of the disease, physical therapy, medications, and injections, which can relieve pressure on the impinged nerves, are among the options for spinal stenosis treatment. Should these prove ineffective, spinal decompression surgery may be recommended to relieve pressure, or compression, on the spinal cord and nerve roots. Common surgical spinal decompression procedures include a laminectomy, removal of the lamina and attached soft tissue, to increase the passage space for the spinal cord and nerve roots. If performed in the lumbar, or lower region of the spine, it is termed a lumbar laminectomy. But this procedure can create spinal instability. The traditional solution has been spinal fusion surgery, in which adjacent vertebrae are fused together with bone graft and metal rods, plates and screws. However, spinal fusion eliminates all motion between the fused vertebrae segments, and can actually accelerate degenerative changes in adjacent segments. Lumbar laminectomy candidates now have an alternative to spine fusion surgery with superior outcomes: Premia Spine’s TOPS™ System provides stability without sacrificing motion. If you’re one of the many suffering from moderate to severe spinal stenosis symptoms, talk to your physician about the TOPS Posterior Arthroplasty to determine whether it’s an option for you.